"ALITTTLRWIGGLEROOM" Wins his maiden race tonight, August 7th, at Pocono DOwns in 1:54.3 Last half in :55 seconds flat. Congratulations to all our Partners. "AJuly 23rd 2018 -- The Partnership has acquired an interest in two exciting pacers. "GWT" 3 yr old Barber Pole colt with a mark of 1:55.0 H. In addition we have purchased an interest in a very sharp MR. WIggles 2 yr old named "Alitttlewiggleroom" The colt is a full brother to Daiymir. He alread has two qualifying races. 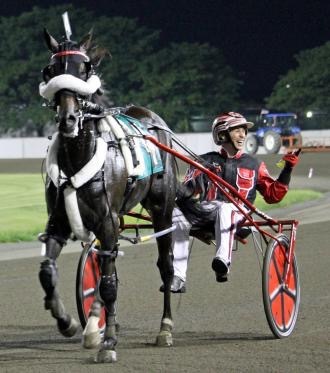 a Win in 1:55.3; and a 3 rd in 1:52 this past Saturday at the Meadowlands. Looking forward to some very exciting races. Big night at Harrington Raceway, May 30th. Two wins for the Partnership. "Alone Hanover" won wire to wire in a good condition race. "Miss Me Yet" won the OPEN race for F&M's in 1;53. A very good trip sitting fourth and into the lane Montrell found a path as our Mare sprinted home in very good fashion. s 3 length WIN at Dover in a lifetime mark of 1:55. Congratulations to our "pretty filly." The Breeders Crown FFA pace was a huge effort on a cold and windy night for Wiggle It. Cutting the mile with a last half in :53.4/5ths on the front end giving Always B Miki a two hole trip was the result of the mile. With a $420K purse the second place doubled the supplement fee. Great job Montrell and Wiggle It Jiggleit ! Wiggle It Jiggleit "WINS" convincingly in the Invitational Pace on Saturday by an easy 2 lengths. A great Day for all. Many partners were at the track rooting on our SUPERSTAR. WIggle It Jiggleit won The Dayton Pacing Derby in a convincing come from behind style. With a super dirve by Montrel WIggle It won over Always B Miki by a nose. Major exciting race. Wiggle It Jiggleit raced absolutely superb to WIn the Quillen Memorial pace in 1:50.0 on Monday at Harrington. WIre to wire on a track rated sloppy. Congratulations to all. The Partnership two year old pacing colt "Rat Tail" followed in WIgglet's footsteps on Tuesday winning his first parimutual start in a division of the Delaware sire stakes in 1:57.2. Racing off the pace Rat Tail passed the field in the 3 rd quarter to draw off and win strongly. The "Battle" at Scioto on Saturday was just incredible. Wiggle It paced Q's of :25.2 and :26 in the same mile. The first one parked. World record mile and beaten by half a length. WOW !! This week we also had Miss Me Yet pace a string closing mile at Harrington. Lastly, but not least, I was SUPER impressed with Alone Hanover's win. She was as slick as can be. tonight with Randy Tharps. A major win !! Wiggle It Jiggleit reigned "supreme" in the Dan Patch at Hoosier on Friday night An incredibly smart drive by Montrell and tenacious strength by Wiggle It in the stretch drive This was a major victory in every sense of the word Congratulations to all. Wiggle It Jiggleit was absolutely spectacular last night at Saratoga Harness winning the Joe Gerrity Memorial. Parked to the half almost the Big Horse still drew off in the stretch by 2 lengths. Montrell gave him the most patient drive I've seen in many many years. Wiggle It Jiggleit takes new lifetime mark, 1:47:2/5 WINNING the Graduate Final at the Meadowlands In a driving rainstorm. The BIG horse paced past Freaky Feet Pete in the stretch to win by half a length Congratulations to All !! "Alone Hanover" looked more like a Lear jet than a 2 yr old pacing filly on Tuesday at the Meadows. Our Dragin Again filly cut the mile in reasonable fractions Towards the 3/4 pole Montrell "popped" the ear plugs and Alone just hit a new gear ! Opened up on the field pacing her last Q in :27.3 I believe she surprised everyone including Montrell who was very impressed with the filly Congratulations to all ! Saturday at Pocono Downs the Ben Franklin final was as competitive a race as possible . "WIGGLE IT JIGGLEIT" raced an extraordinary mile After leaving hard he came first over in very swift fractions against the 5 yr old Always B Miki who in the end prevailed We are very proud of Wiggle It's 3rd place finish in this world record timed race. Our well appreciated race on Saturday was Miss Me Yet's win in the sire stakes at Scioto Downs The filly took a new lifetime race mark of 1:53.2 Congratulations are in order to Brenda Teague and driver Randy Tharps. Wiggle It Jiggleit came to Nichols, NY with his A+ Game again. This was a sheer display of incredible speed and stamina, congratulations to all of us.....and especially Montrell, Clyde, Big Mike and Mr Teague, jr.
Wiggle It Jiggleit was absolutely at the top of his game last night at Northfield. With Montrell doing all he could to temper the big horse - the fractions of a 1st half in :55 and a last half in :54 our 4 yr old was totally dominating. On another note I was so excited to see our Partner, Norma Eurestie, in the winners circle What an honor for all of us !! Wiggle It Jiggleit raced a HUGE race tonight at Flamboro. WIth the temperature about 5 C, our colt came two wide and three wide the last half which was in about :54 seconds. Proud of our colt. You can co-own 2015 Horse of the Year "Wiggle It Jiggleit" with George Teague, Jr.
Have you dreamed of owning an interest in one of the greatest racehorses EVER? Teague Racing Partnership, LLC 2016 is proud to offer an ownership opportunity for both novice and seasoned Standardbred owners in Wiggle It Jiggleit* World Champion winner of 23 of 27 starts with earnings nearing $2.2M. Winner of the epic battle in the 2015 Little Brown Jug. The greatest harness race since the advent of the mobile starting gate !! MOZZI MINAJ* p, 2, Q1:59f ($1,375), Wiggle It Jiggleit’s full sister. She’s a fresh, fast filly who had just one race start as a 2yo, just like her big brother. 2-year-olds* trained and co-owned by George Teague Jr., chosen by George and managing partner Jimmy Bernstein before qualifying day. Limited Member units are $15,000 each. Maximum of five (5) units per partner. Enrollment closes April 30th 2016.